With 6 sets of tees to accommodate all levels of play, Rainbow Ridge boasts a challenge for both the avid golfer and beginners alike. The Yardage is 6424; the course features nine water holes as well as large greens and several sand traps. 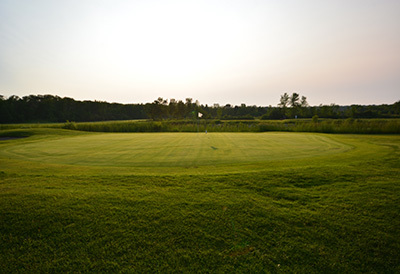 Our driving range is an added feature as well as our numerous cart and club rentals. Restaurant open during golf season. Indoor golf available. Call for more information. Open May to October. Indoor golf league available in the off season, call for more information.